Little VICSI is blissfully unaware of his unique place in the field of assisted reproduction in the horse. 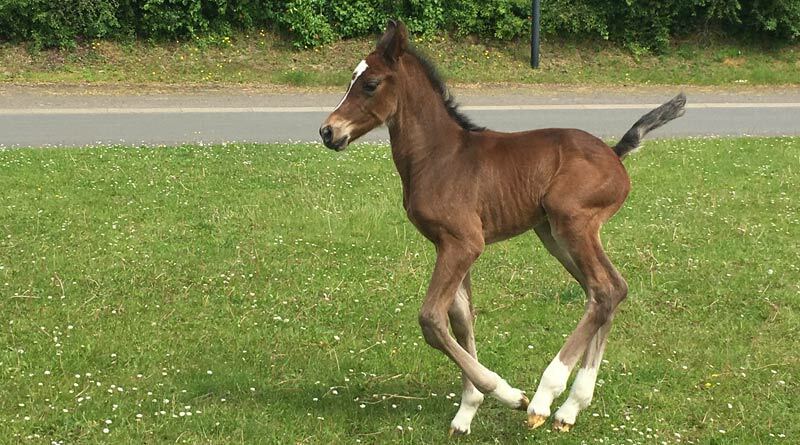 A test-tube foal born in Belgium was conceived using a breakthrough technique in the field of assisted reproduction in the horse. The stallion has been called VICSI – a name that combines the two reproductive techniques used by specialists in the Faculty of Veterinary Medicine at Ghent University to conceive the foal: vitrification and ICSI. Vitrification is a cryopreservation method during which oocytes, or immature ovums, are cooled rapidly, resulting in the formation of a glass-like structure that avoids the formation of ice crystals which can damage the oocyte. For ICSI − that’s intracytoplasmic sperm injection − delicate manipulation is used to inject a sperm cell into an oocyte. Oocytes are much more sensitive to low temperatures than embryos. Their successful vitrification amounts to an important breakthrough in assisted reproduction in the species. VICSI, born on May 12, is the living and breathing result of research at the department of Reproduction, Obstetrics and Herd Health under the supervision of Professor Ann Van Soom. For the research, Nerea Ortiz Escribano, who earned a PhD on vitrification, collaborated with Katrien Smits, who works as a postdoctoral researcher specializing in ICSI. The oocytes for the research were removed from equine ovaries collected at a slaughterhouse. These immature ovums were vitrified and stored in liquid nitrogen for a week. The oocytes were then matured in an incubator after rapid warming. The mature oocytes were then fertilized by ICSI and cultured in the incubator for nine days. The resulting embryo was transferred to the uterus of a recipient mare on June 20 last year at the Animal Embryo Centre Diergaerderhof, in the Netherlands. Nine days later, an ultrasound examination confirmed that the mare was pregnant. Cryopreservation of oocytes offers several possibilities in veterinary medicine, the specialists say. They can be stored and transported for research or for clinical purposes. In the future it will be possible to store oocytes from a valuable mare instead of embryos only. This provides more flexibility for the owner over the choice of the stallion. Up to now, the owner has had to decide immediately which stallion was going to be used for fertilization as the oocytes could not be stored. Also, the freezing of oocytes provides opportunities for the conservation of the genetics from rare or endangered horse breeds or equids, such as zebras. However, further time is needed to optimize the technique, which has been developed in a scientific research context to a level that allows practical applications. In the study, the findings of which will be published in the Equine Veterinary Journal, only 34% of the vitrified oocytes matured and only 5% of the injected oocytes developed to a good embryo. Using fresh oocytes, the maturation rate is 60% and 20% of the fertilized oocytes that develop into an embryo that can be transferred to a mare. The arrival of VICSI is an important step towards these practical applications, the researchers say.